The 85 x 85mm Warm Clear Movie Mist .5Filter from Hitech is a soft focus filter that also adds a touch of warmth to the image. Primarily targeted to the MPTV markets, it also has viable uses for traditional film and digital applications. 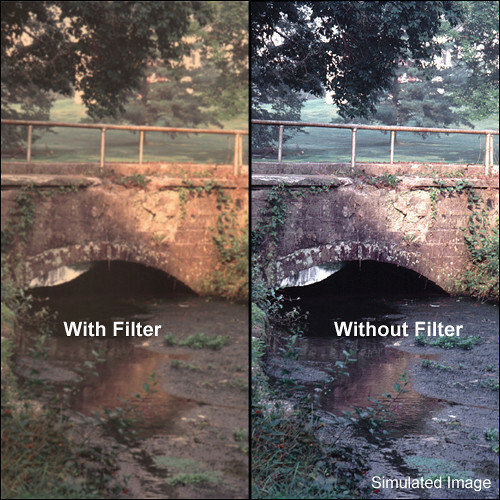 This filter is characterized by a reduction in overall contrast as well as a smooth, flattering softening effect. It also accents highlights but will not blow them out. Facial imperfections will also be minimized. The Warm Clear Movie Mist .5 Filter is the first step available for this filter. It adds a minimal amount of warmth to the image while reducing contrast a touch. Highlights show up stronger. The Warm Clear Movie Mist Filter is a variation on Hitech's standard Clear Movie Mist Filter but with the addition of a warming element that is useful when the sky is overcast or you're shooting in open shade. It is especially valuable as a portrait filter or when shooting an interview for TV and you wish to enhance your subject's appearance. Box Dimensions (LxWxH) 3.6 x 3.6 x 0.1"